Energybits.... strange but GOOD!!! I recently contacted the company after hearing some buzz in the running world about these small green things. The company graciously sent me a sample and I got to try them out. I opened the package and was surprised to what I saw. I had read about them and how they were 100% algae and 60% protein but was not prepared for this. "100% algae 60% protein & ONLY ONE CALORIE each! Healthy little snack and natural source of ENERGY to supercharge you, leaving you mentally and physically stimulated for any activity!" We started our company because we want you to have an easier, faster way to be healthy and energized. We also want to make the world a better place. So we decided what ever we did had to be completely natural, good for both you and the environment, high protein, low calories, fun and stylish! After four years, we finally found the answer. Algae. Want more energy, more mental vitality, or a healthy high protein snack you can grab on the go? How about a quick way to boost your athletic performance, supercharge your run or crank up your endurance while working or working out? If so, ENERGYbits® are for you. Made from 100% organicallly grown spirulina algae and loaded with 40 nutrients, ENERGYbits® algae tabs have the highest concentration of protein in the world (64%) all for just one calorie per tab. Endorsed by the United Nations as the most nutritious food on earth, spirulina algae has been a favorite of Olympic gold medalists for decades and is a super food in every sense of the word, delivering instant and enduring energy to your brain and body. Check them out at energybits on the web or on Facebook at energybits. Now onto my experience with it. I have been having dead leg days around here. I decided I would try them before my mid-week run and took around 20 "food bits" as they are called. I took them with water because truthfully I don't think I want to have all that algae stuck between m teeth while I'm running around!! I took them about 15 minutes prior to my run. I felt good, legs were not dead. I have tried the "food bits before Insanity and have made it through the workout with little fatigue. They seem to work. I have a few left and am going to try again before my long run. I am always VERY hesitant of what I put in my stomach before runs as I have a sensitive stomach and don't want to ruin my longs!! So here's the part everyone has been waiting for..... the giveaway. 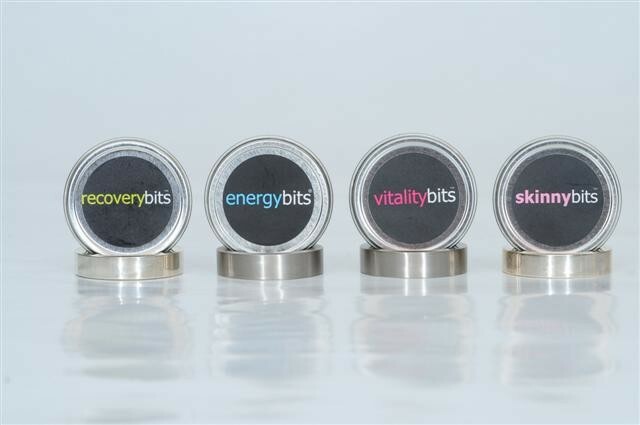 Energybits will be sending one of you lucky folks some of these precious "food bits" Follow the rafflecopter and good luck!!! I have tried energy bits before, but would love to use them again! I haven't tried them yet, but I've heard great things about them and would love to give them a shot!! I have tried them before.. but never hurts to try again. Never tried them but have heard lots about it. Something that I would love to try! I have tried them and I am hoping I can apply to become an ambassador soon. Week accountability and current giveaway! Running plans and upcoming review and giveaway!! My awesome week so far!! Giving in for a little!! !